Procyanidins are phenolic compounds from plants and they are abundant in our diet. Research studies on procyanidins have shown that they have many health benefits, especially as preventive agents for cancer, cardiovascular diseases and diabetes. High concentrations of procyanidins can be found in plants and foods such as red wine, grapes, grape seeds, cocoa, berries and apples. The first chapter of this book reviews the occurrence and the structure of these compounds. Since the extraction method is considered a critical step in procyanidin analysis, the second chapter describes the various methods used in literature so far with reference to the most important factors influencing the extraction. Furthermore, common separation and detection methods like high performance liquid chromatography and mass spectrometry are presented in order to give the complex image of the existing methods described so far. These principles of procyanidin fingerprinting are reflected further in studying the seed shells of the Japanese horse chestnut (Aesculus turbinata BLUME), discarded as waste materials after the preparation of edible seeds. The highly polymeric proanthocyanidins from the Japanese horse chestnut were tested for their health benefits, and this is presented in Chapter Three. As the interest in antioxidant compounds increases, the interest in studying their bioavailability has increased as well. In the context of controversy surrounding the studies on procyandins’ absorption and metabolization, the next chapter tries to present different points of view related to this matter. Several applications of procyanidins in food systems are reviewed in Chapter Five, including: Co-encapsulation of green tea catechins on probiotic bacteria viability during simulated gastrointestinal digestion, stability of polyphenolic compounds on alginate, and chitosan microcapsules and procyanidin effectiveness after incorporation into food edible films. The final part of this book investigates the procyanidin structure-activity relationship and mechanisms of cardiovascular diseases because the intake of procyanidins has been associated with reduced cardiovascular disease risk by epidemiologic studies. 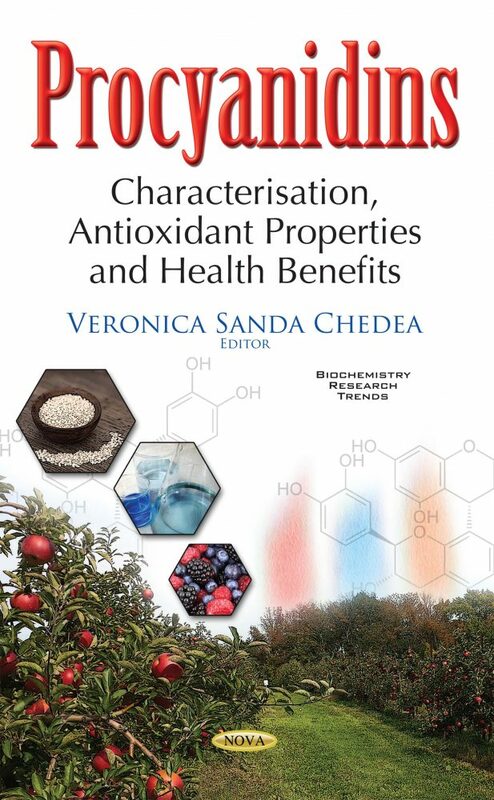 This book is directed to graduates studying food science and technology, nutrition, pharmacy and health and for researchers, scientists, policy makers and professional from food, pharmacy, nutrition and biotechnology industries working on polyphenols’ in general and on procyanidins’ in particular characterization, antioxidant properties and health benefits.